The TrikeBuggy Mini-Bullet is specifically made for the lighter motors and pilots. 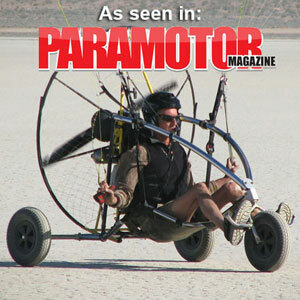 This design is for the paraglider version only and is FAA Part 103 legal as an Ultralight Vehicle or Aircraft. The TrikeBuggy Mini-Bullet version 3.2 is now ready! This is our latest design that features our new and simpler rear frame and the lower, wider upper bar setup of version 3, which gives the pilot better visibility and makes it easier to get into the trike from above. 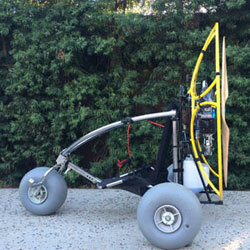 The TrikeBuggy Mini-Bullet "Stretch" Version 3.2 is now available for long legged pilots! This new addition to the TrikeBuggy Family includes the Extra-Long Front Downtube and Extra-Long Curved Tubes to add another 4" of length to the TrikeBuggy. Made for the smaller motors! This new TrikeBuggy Mini-Bullet is perfect for the new generation of lighter, smaller motors like the Miniplane, PAP, and other paramotors with less than 150cc. The shorter wheelbase makes this TrikeBuggy lighter and more maneuverable. The Mini-Bullet still features the Slider Axles to minimize width for transport and still giving a wider stance for flight. With our various wheel options, the Mini-Bullet can be made even lighter! Smaller footprint, but not smaller pilot! Even though the TrikeBuggy Mini-Bullet's overall wheelbaselength and width are shorter, the actual frame size where the pilot sits is exactly the same size as the regular TrikeBuggy Bullet, making this as comfortable a ride as the original! The rear axle simply uses the smaller, more abbreviated axle which also includes the Slider feature! The Bullet's frame is simple and solid. It is sleek and racy, giving the pilot a protective cage that will protect the pilot from contact with the ground in case of a rollover. 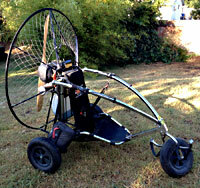 The TrikeBuggy Bullet uses an incredibly robust Stainless Steel Kite Buggy as the foundation for this unique PPG Trike. The new design allows the pilot to quickly dismount the motor for use as foot launch or to transport. The Bullet also quickly disassembles for packing away, and accepts our new EyePod Fairings as well as having it's own accessories such as Bullet A-Assists and Intuitive Foot Steering System made specially for this new cage design. The Bullet also incorporates our latest innovation - the TrikeBuggy Low Hangpoint System. This allows the use of virtually any paraglider whether it has trimmers or not. The risers are positioned much lower than most PPG Trikes, bringing the brake position down to a comfortable reach for even the shortest pilots. 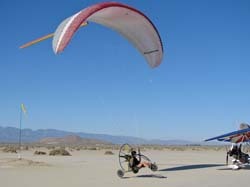 This system is unique in the industry, since it allows the pilots to use their regular paraglider without making modifications to it. 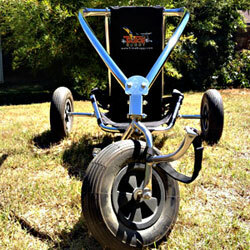 The TrikeBuggy Bullet has one more distinguishing feature - it includes the Bullet A-Assists at no additional charge. These great accessories make the inflation of the wing a snap, with no input needed from the pilot! Simply hook up the A-Assists and watch your glider come up evenly every time (well almost!). The glider gets the best chance at a perfect inflation, since the A-Assists always pull evenly on the A risers. Ask about our various wheel options! Weight with Narrow Wheels (as shown): 60 lbs. When assembled, the TrikeBuggy Mini-Bullet V3.2 is 63" long (tip to tip on tires) and 46" wide, but the Slider axles can be shortened to less than 34" wide!